This is an update on Remy's health since he was featured in Trying to Beat Respiratory Problems in Pet Rats: Remy last year. Like Sadie in the latest story on this site, Remy came to me because someone was moving out of town and dumped him at the pet store. I had lost a rat that looked like him ten days before. Remy has always been lucky. They knew I was looking for another rat, and called me right away. Remy has been with us almost two years (he came on Bastille Day). 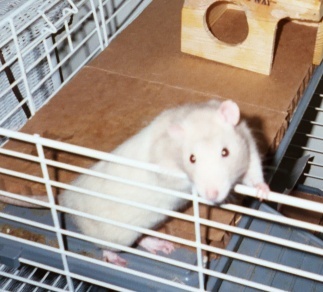 He's outlasted many other rats and has been very friendly and laid-back and in general good health. He gets a lot of love and responds in kind. Two weeks ago Monday I decided to feel him for lumps. I came across a big one that had broken through the skin with a sore. I got him to surgery by that Thursday. The surgeon removed two large lumps, one the size of a golf ball. Remy immediately started feeling better and was picking up his own food and eating. One of these tumors is benign. The other is a low grade basal-cell cancer that is not likely to spread. It also appears the surgeon took it all out. Remy has been eating well, playing, and displaying his usual joie de vivre. Except that part of his fur is shaved off, you would never guess anything happened to him. Remy had a narrow escape and was very lucky. Dr. Haims, the veterinary surgeon, saved his life. I guess the moral is you can't pay enough attention to these animals, especially when a domesticated one is dependent on you for everything. We hope Remy will be with us awhile yet.